The concept for the first Wreck-It Ralph film enticed me upon announcement; however, each of it's trailers made me less and less and hopeful for the final outcome, for each one seemed to portray the film as something obsessed with abusing the video game setting and the dozens of potential references within it as a result. Amongst all this was generic modern music, endless pausing a quick one liner, rinse and repeat; but once the final film was released, what we got was a well rounded story arc about a troubled protagonist, put together with a witty and charming script and superb handling of the various aforementioned references at it's disposal. A similar situation comes about with this less than faithful sequel, albeit much worse. 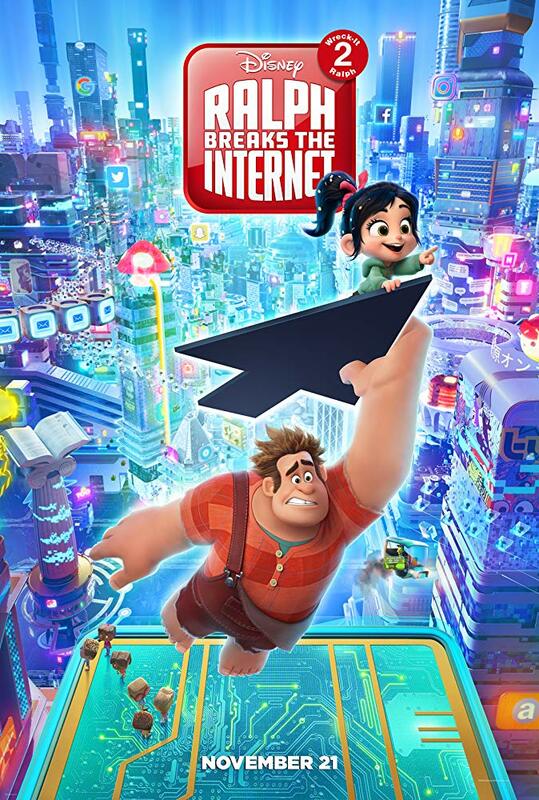 Ralph Breaks the Internet, already losing points for it's ridiculous title, repulsed me to say the least when I saw it's various trailers that seemed to just milk the potential for god knows how many more references given it's immense setting of the world wide web. The core story this time round features Ralph (John C. Reilly) and Vanellope (Sarah Silverman) venturing into the internet itself when WiFi arrives at the local arcade, their goal to seek out a replacement steering wheel for Vanellope's broken game through eBay before it's left defunct and thus disposed of. A major issue I had with Wreck-It Ralph 2 (I can't stand typing that stupid title over and over) is how it obsesses over many pop culture traits, and while it's certainly amusing at times, this ongoing obsession can often obstruct from the story and characters. This is most common during the middle portion of the film, which is left unfocused, boring, and poorly structured, once again obsessed with milking these pop culture gags than advancing the narrative in a creative an engaging way; something the original did extremely well. Unlike the original, which cleverly integrated numerous video game references into the story within it's fictional setting, Wreck-It Ralph 2 is largely full of settings that are essentially real websites and apps, leaving it really hard to take seriously half the time. It attempts to build upon the friendship between Ralph and Vanellope in an interesting way, but largely falls flat, awkwardly rushing through most of it at the last minute due to wasting most of it's time on repetitive humour. Even some of the film's inevitable "emotional" moments reference pop culture trends on the internet; not only do they feel very forced, but once again incredibly hard to take seriously. But in spite of all these faults, it's fair to say that this sequel isn't all bad; once again, whilst it certainly overdoes it's humourous pop culture references, some of them are genuinely funny and well crafted. The lead vocal performances are also as solid as they were in the original, primarily Reilly as Ralph himself, who carries much of the film's key humour; likeable and fun, if sometimes a bit annoying, he finds himself undeniably one of the film's best traits. It's also impossible for Disney to create bad animation, as we all know by now; but all this sadly can't redeem many of Wreck-It Ralph 2's central flaws, which extend from much of it being largely dragged out and once again obsessed with parodying many modern internet trends (and even many Disney trends, including those ungodly annoying princesses) which in the end leaves us with a film that starts off appealing, has a decent finale, but otherwise fails to impress compared to the original.